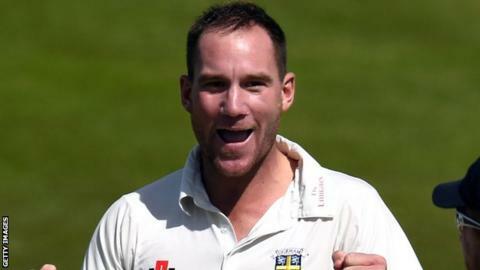 Australian all-rounder John Hastings has committed to a third season with Durham, extending his stay for the 2016 County Championship campaign. The Penrith-born 29-year-old will also be available for the One-Day Cup and T20 Blast competitions, while playing for Melbourne Stars in the winter. Since joining in 2014, Hastings has taken 76 first-class wickets in 20 games for Durham. "I expressed an interest that I'd love to come back," Hastings said. "I'm really looking forward to finishing off this season well with the boys, because there's still a chance for trophies at this stage. "The people in the dressing room and the people up here in the North East are just fantastic, so my wife and I really enjoy it and want to keep coming back." Hastings has played 11 one-day internationals for Australia, and is a limited-overs specialist who has played in both the Indian Premier League and Australia's Big Bash. "He's been instrumental in all competitions for us since he first came to this country," head coach Jon Lewis added. "He's a big personality, and a big bloke, who has fitted in really well at Durham."